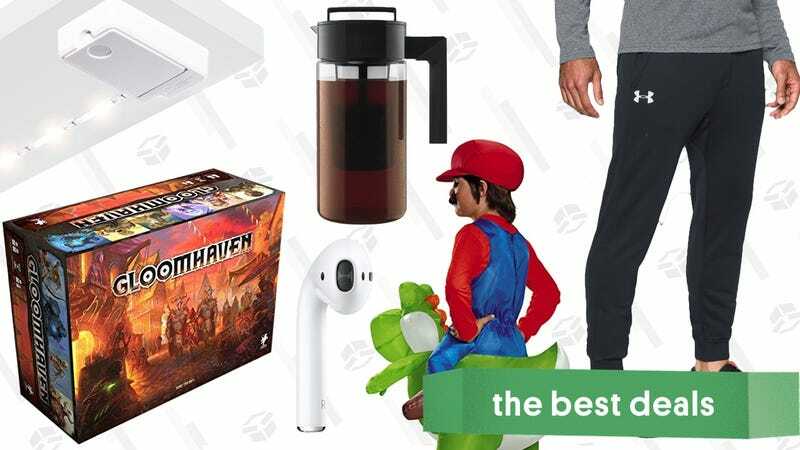 The best board game in existence, $128 AirPods, and the new Luminoodle Click lead off Monday’s best deals from around the web. Apple’s excellent AirPods didn’t get an update at the last iPhone event, which means it’s probably safe to buy a pair, especially when you can get them on sale. Use promo code SAVE15 to get a set from Rakuten for just $128, the best price we’ve ever seen. I’ve had mine since the day they came out, and they’ve carved out a permanent place in my pockets. Bose’s wireless QuietComfort 35 noise-cancelling over-ears are basically a mute button for the rest of the world, and you can get them for $274 at Rakuten today, down from the usual $329, with promo code ALT55. Just note that you’ll have to be signed into a Rakuten account to use the code. Continuing a recent run of Gold Box deals, Amazon’s running a one-day sale and select Anker Soundcore audio gear, today only. On the headphone front, you can choose from the lightweight and exercise friendly Soundcore Spirit earbuds, or the comfy, over-ear Soundcore Vortexes, which run for 20 hours on a charge. Or hey, you could buy both. The new Soundcore Flare Bluetooth speaker is also included in the sale for $45. It features 360 degree audio, IP67 water resistance, and even a beat-driven ring of LED lights along the bottom, making it a party in a can. Once you get your first Qi-charging phone, you quickly come to realize that you can never own enough charging pads. This one from Aukey doesn’t have higher-wattage charging speeds like some others we’ve seen, but it looks perfectly nice, and it’s only $9 with promo code AUKEYL86, which is about as cheap as we ever see these things. The Logitech K400 is a wireless keyboard and a trackpad, making it perfect for controlling your home theater PC, game console, or smart TV from the couch. $17 is the best deal we’ve ever seen, so click on over to Walmart before it sells out. It doesn’t support 4K or HDR, but for a basic home theater streaming dongle, it’s tough to beat the Amazon Fire TV stick at $30, especially considering that it comes with a voice remote. Luminoodle Click | $17 | Amazon | Promo code 43YMZIXT. Three-pack also available for $34 with same code. It’s an affordable product to begin with, but right now, you can save 15% with promo code 43YMZIXT. That’ll work on the daylight or warm white versions, and on the single pack or the three-pack, which is basically a three-for-the-price-of-two deal. If you want the convenience of a Wi-Fi and Alexa-compatible thermostat, you don’t have to pay out the nose for a fancy touchscreen model from Nest or Ecobee. This Honeywell is ugly as hell, but it has the same basic set of smart features for just $69. If installing a smart lock has been on your to-do list for awhile, the brand new third generation August Smart Lock Pro is $30 off today. This lock allows you to, obviously, control lock or unlock your door via your smartphone or Alexa. But when it really comes in handy is when you want to let in a pet sitter or overnight guest. Just send a temporary key to their phone, and you’ll get a notification when they enter. You need dishwasher detergent anyway, so you might as well buy it on sale. While supplies last, Amazon’s offering a 20% coupon on this 82-pack bag of Finish Quantum tabs, bringing it down to $13 when you combine with Subscribe & Save savings. Iced coffee is a brilliant way to sell people ice for the price of coffee (which is mostly water to begin with). Cold brew on the other hand is a different process that results in less acidity, among other benefits, and you can do it yourself at home with this top-selling Takeya, now down to $15 on Amazon. $15 is the best price we’ve ever seen on this, so wake yourself up and get over to Amazon. The original Dash Egg Cooker was one of the fastest items to ever join our bestseller pantheon, and now, you can score the Deluxe model for just $26, the best price we’ve seen in months. This is the same Dash our readers know and love, but now it can cook a full dozen eggs at once, rather than just six. If you own an oil diffuser, you know a set of eight oils for $9 is an absolute steal. It’s marketed as a gift set, but we won’t tell anyone if you keep it for yourself. Update: This was available earlier in the week for $85 ($15 off), but now it’s down to $80. While we usually see bigger discounts on major sales holidays, if you want an Instant Pot pressure cooker in time for Thanksgiving dinner prep, this $20 discount on Amazon is a solid deal. If you could use more storage space around the house, these Muscle Rack steel shelves would be ideal for a garage, a utility room, or even an industrial-chic kitchen. Two different sizes (large/small) are on sale at Walmart right now for $60 and $36, respectively, so you can mix and match. What better way to get ready for fall weather than an extra 20% off Under Armour’s already affordable sale sectiont? Pick up workout shirts, sweats, leggings, shoes, and more, and use promo code GEARUP20 at checkout to stack on the savings. $5 standard shipping, or free shipping on orders over $60. Need a new purse to schlep around all the stuff you’ve bought from Kinja Deals? Nordstrom Rack is running a purse satchel clearance event full of brands like Marc Jacobs and Ted Baker London that even I, a purse idiot, know to be good. As always, you can use the dropdown menu on top to filter by designer. Shop Nordstrom Rack’s Travel Flash Sale and save on hundreds of pieces of luggage, including luggage sets, carry-ons, back packs, hand bags, roller bags, and duffels. There’s a wide array of brands in the mix too, like Samsonite, Briggs & Riley, Herschel Supply Co., Kenneth Cole, and more, so now’s the time to upgrade before the holiday travel season sneaks up on everyone. I know it’s officially fall now, but as far as I’m concerned, every season can be cooler season. Two great options from Coleman are ridiculously cheap at Walmart right now, drinks not included. BBC Earth’s renowned series, Blue Planet, returned in 2017 after more than a decade since the original was released, giving viewers another 8 episodes of underwater exploration. Now Blue Planet II is available in 4K HDR for just $30. Enjoy the wonders of our oceans from the comfort of your couch with the illustrious Sir David Attenborough as your trusted guide. Update: Back up to $140. Try not to freak out, but this post is about a $103 board game. That sounds like a lot of money. It is a lot of money. But Gloomhaven is Board Game Geek’s #1 board game ever, and is “astoundingly good” according to Ars Technica. Hell, it weighs 20 pounds! The thing is though, even when retailers have it in stock, it usually costs $140+, and eBay resellers will charge you even more, so this is a major discount we’re talking about here. It’s listed as “temporarily out of stock,” but you can still order it at this price, and Amazon will ship it to you when they have more. If you love board games, this should be on your bucket list. The game includes permanent stickers that transform the board as you play, but you can grab this removable, vinyl sticker pack instead for just $9, which is within a few cents of an all-time low. While you have your wallet open, this is the kind of game that deserves a dedicated board game table. If you’ve bought a Pro Controller to go with your Switch (and you should! ), this dock can charge your gamepad and a set of Joy-Con at the same time. Get it for just $10 today, an all-time low.